Whenever someone asks me what generation Japanese American I am, the short answer is that I’m nisei. My parents immigrated to the United States in the mid 1990s, and I was born in Mountain View in 1999. The long answer? The fact that I’m nisei remains—but I’m not the first one in my family to be born in the United States. My paternal grandfather, as well as his siblings, were all born in San Francisco in the late 1920s. And so, although in 1931 my grandfather and his family moved back to Japan, the fact remains that my grandfather was technically a nisei seven decades before I was. 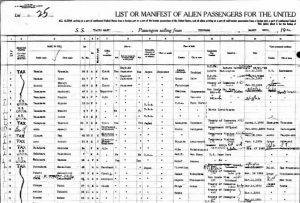 Recently, while working as an intern at the Angel Island Immigration Station Foundation, I was able to find ship logs documenting the voyages of my great grandparents, as well as city directory logs of where they lived. 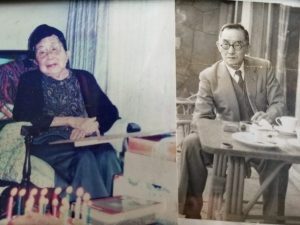 Combining what I learned from oral recollection, along with photos and documents I found here and in Japan, I was able to recreate the journey of my great grandparents, immigrants to the United States whose stories start and end in Japan. My paternal great grandfather (my father’s father’s father), Sakae Tanaka, was born in Tokyo around September 1890. While I don’t know much about his early childhood, he attended the Tokyo College of Commerce, (present-day Hitotsubashi University). 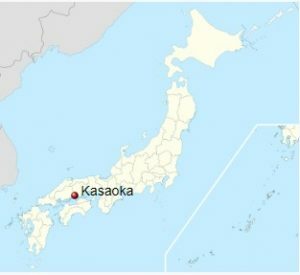 After graduating from college, Sakae worked for Nippon Yusen Kaisha, a major shipping company that is still operational today. During the early twentieth century, Nippon Yusen Kaisha was responsible for not only connecting Japanese ports like Yokohama and Kobe to colonial ones like Ryojun, but also to foreign ones like San Francisco and Seattle. 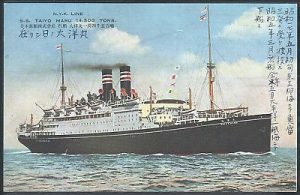 Many Japanese immigrants to the United States during this time period likely would have embarked on a Nippon Yusen Kaisha liner. “under bond.” He was in “good physical and mental health,” according to the inspector, so it may have been because he was a clerk and not a merchant or banker like the other five Japanese men who were all admitted. Regardless, he worked in Seattle from 1919 to 1925, and a Seattle directory published in 1920 mentions him living on 903 9th Avenue as a clerk. With public transportation in Seattle starting in 1920, Sakae may have witnessed the first electric streetcars to roam the city. 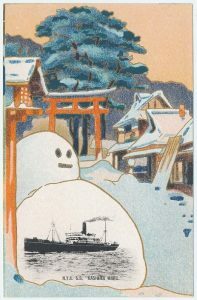 In 1925, he returned to Japan. (I was unable to find ship logs for his return to Japan, so I unfortunately do not know the specifics of where and when he arrived in Japan.) Once in Japan, he married a woman named Kei Yasada from Kasaoka, Okayama Prefecture. At this time, Sakae would have been around 34-35, and Kei would have been around 20-21. Kei would later become mother to my paternal grandfather. Kei was a Christian, which is quite rare in Japan, and she was also quite educated compared to other women in her time, as she attended and later taught at a female high school in Okayama Prefecture. After a relatively short period together, Sakae headed back to the United States by himself in 1926, this time to San Francisco aboard the Taiyo Maru. Originally a German ship, the Taiyo Maru changed hands from Germany to the United States to Great Britain to Japan in the years after World War I. Leaving Yokohama on March 20, Sakae arrived in San Francisco on April 5. 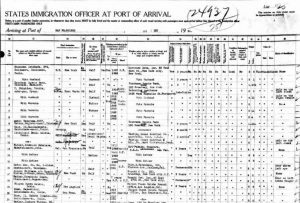 On this ship log, he mentioned that he had already lived in America from 1919 to 1925 in Seattle and was heading to the Nippon Yusen Kaisha Branch Office, located on 557 Market Street. The man immediately above him on the ship log, a Tadashi Ashino, was also heading to work at the same Nippon Yusen Kaisha office in San Francisco. While I’ll never know what my great grandfather did on his voyage across the Pacific, it wouldn’t be unreasonable that perhaps Sakae and Tadashi played cards, smoked, and talked about their work together. At the time Sakae arrived in Japan, his wife Kei was still in Japan, presumably in Tokyo. 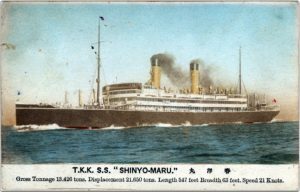 On July 14, 1926, however, Kei set sail aboard the Shinyo Maru from Yokohama bound for San Francisco to reunite with her husband. On Kei’s ship log, she mentions her occupation as a housewife and her nearest relative as her father-in-law, Tetsuo Tanaka. She also mentions her husband’s address as 557 Market Street, the address of the Nippon Yusen Kaisha Branch Office. Interestingly, the ship log shows Kei’s intended duration of stay in the United States as permanent. This doesn’t match up with the fact that Sakae, Kei, and their children moved back to Japan five years later, leading me to think that perhaps, in 1926, Kei and Sakae expected to remain in America long-term. My grandfather tells me that, while sailing across the Pacific Ocean, Kei was worried that she would not be able to recognize Sakae once she landed, as the two of them had been married for a relatively short time. She also learned some English from a fellow passenger onboard the ship, perhaps to better prepare her for the questioning she would receive at Angel Island. She eventually arrived on July 30 in San Francisco, where she was pronounced as being in good health. As a newcomer, Kei most likely had to go to Angel Island for the physical exam and interrogation, like many other Asian immigrants of their time. One can only imagine what the experience must have been like for Kei, a 21-year-old woman going to live in a foreign country, being questioned by Westerners with the help of interpreters in an unwelcoming setting. Once the two of them reunited in San Francisco, they lived at 2906 Broderick Street, as evidenced by a directory published in 1927 and 1930. While they were living there, they had three children. The eldest son, Akira, was born on July 10, 1927. Their second son and my grandfather, Yuji, was born on June 8, 1929. Their youngest child and only daughter, Kyoko, was born on November 19, 1930. 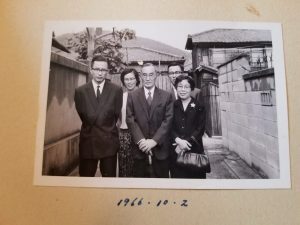 While the Tanaka family was living in San Francisco, they may have seen the impact of the Great Depression, which started just a few months after my grandfather was born. In 1931, perhaps due to the economic situation in the United States, the Tanaka family returned to Japan. They went to Kobe City in Hyogo Prefecture, where they lived in present-day Suma Ward. Between 1937 and 1941, Sakae, still working for Nippon Yusen Kaisha, went to Mumbai by himself. In 1942, after the Japanese invasion and occupation of the Dutch East Indies, Sakae went to Indonesia, where he worked in a civilian role, shipping resources, goods and people between the various Indonesian islands for the military. During the wartime period, the Nippon Yusen Kaisha and other shipping companies were used for war purposes, with many passenger liners used as troop transports. Out of the three ships mentioned in this story—the Kashima Maru, Taiyo Maru, and Shinyo Maru—the first two would be used as army troop transports, while the third was scrapped before the war in 1936. The Kashima Maru was sunk by the American submarine U.S.S. Bonefish in 1943, while the Taiyo Maru was sunk by the American submarine U.S.S. Grenadier in 1942. Even after the Japanese surrender in 1945, Sakae had to stay in Indonesia for another year. This was because the logistics to repatriate the large number of Japanese civilians and soldiers in Southeast Asia back to Japan was not an immediate process, but rather a complicated one that took many months. After returning to Japan, Sakae lost his job at Nippon Yusen Kaisha. During the time Sakae was in Mumbai and Indonesia, Kei lived with her three children in Kobe, and after Sakae lost his job, Kei stepped in to lead the family, which would have been quite unusual because the typical Japanese family is centered around the father being the main breadwinner. Eventually, as all three of their children grew up, Sakae’s and Kei’s family increased with the addition of grandchildren, such as my father who was born in 1965 in Kobe. In 1973, Sakae passed away. After that, my grandfather Yuji and his family moved to Tokyo and later Yokohama, where Kei lived with them until she passed away in the 2000s. Kei is the only one of my great grandparents that I clearly remember meeting, as she always played with me whenever I would go to my grandparents’ house in my early childhood. Ken Tanaka wrote this as a first-year student at Yale University, during an “externship” at AIISF in 2018.